With the holiday season upon us, whether you’re celebrating Christmas, Hanukkah, Kwanzaa or what have you, gift-giving and proper present selection can be a daunting task for non-vegan friends of vegans, new vegans, and even old-timer vegans like myself. So rather than waste time meticulously reading product labels or searching out that one obscure specialty vegan boutique, I thought I’d share with you my top two vegan holiday gift resources. And, as a bonus, show you how to get 10 percent everything you buy–an offer exclusive to Bite Size Vegan viewers. Because statistics show that viewers of bite size vegan videos are 342.56 percent more awesome than non-viewers. And you can’t argue with science. While most of my video posts center on the ethical side of veganism, the why of being vegan if you will, I realize that it’s also important to address the practicalities of living a vegan lifestyle like holiday gift shopping, for example. Of course, I do consistently bring you the most timeless gift that you could ask for on a weekly basis–the gift of knowledge–(ding) but you may want something a little more tangible this holiday season. perhaps you aren’t a vegan yourself but have vegan friends and family and you don’t want to commit a holiday gift-giving faux pas by giving them a wool sweater or a stylish purse that, unbeknownst to you, has a leather clasp. Or maybe you’re a new vegan and want to be able to tell your own friends and family a simple way to buy you presents without feeling that you’re overburdening them with a detailed list of dos and don’ts. Or maybe you’re like me and you’ve been vegan for a bit, and you want to be able to buy gifts for your vegan and non-vegan friends and family alike without having to spend hours sifting through product and reading labels. You want to be able to go to one source and know that everything is vegan. I especially like to be able to buy cruelty-free presents for my non-vegan friends and family that don’t scream “I'm vegan!” so I can get them items they appreciate and stay within my ethics. Plus it’s a subtle form of activism to show how awesome and “normal” vegan gifts can be. I’m sneaky that way. So let’s get down to it, shall we? I’m going to tell you about my top two vegan gift resources and then tell you how to get 10% off your purchases, just for being the wonderful Bite Size Vegan viewer that you are. My first shopping resource is VeganCuts.com, which is a website that specializes in a variety of gift baskets and monthly subscription boxes, when you want to give the gift that just keeps on giving. For your brand-new vegans out there, they even have this awesome vegan starter kit with loads of treats and educational information like the documentary Vedgucated, a vegan starter guide and recipe ideas. and it’s currently 36% off. If you’re overwhelmed and not sure which direction to go in for your present-acquisition mission, you can simply click on their holiday gift ideas button for a slew of suggestions and a tool for narrowing your choice by the recipient or your budget. And you can rest easy knowing that everything is vegan. (See the bottom of this post for all relevant links). Now my second shopping resource is one I’m really excited to introduce to you guys. this is my go-to resource for vegan gifts and my one-stop shop for my own vegan product needs. It’s a website called VeganEssentials.com and I’ve been shopping there since 2012, way before I was Bite Size Vegan. Well, I still was a vegan and bite size but before it was official through the YouTube. There are many things i love about Vegan Essentials: they are vegan founded, owned and operated, they have a wide selection of products, many of which fill the role of “stealth vegan gifts” for non-vegans, like steel-toed leather-looking boots, aged artisan cheese and Viana sausage snacks, and cosmetics and skin care, not that any of those are particularly Christmasy or holiday in nature, but you catch my drift. and the thing that I love most is that I don’t have to read labels or worry about ingredients–cause I ain’t got time for that. So, for some actual holiday-themed gifts, if you’re not into my steel-toed boot/aged cheese/sausage/cosmetic/skin care concept…I thought it had potential…Vegan Essentials also has a holiday gifts and food section. But definitely check out all they have to offer from clothing to delicious snacks, treats, and even meals, to toiletries, to books, videos and music, and more. If you’re a newly vegan family and looking for ways to communicate the vegan message to your children, they even have children’s books that can help you convey the value of compassion. And if you have children of the furred variety, there’s an extensive companion animal section complete with veggie pig ears and bacon. So I know this video post may seem a little out of step with the typical subject matter of my site, but I think it’s valuable to provide you with practical tools alongside the intellectual ones I usually hand out. So, here’s how you can get your 10% off. When I was thinking of making this video for you guys to help with your holiday shopping, VeganEssentials.com immediately came to mind and I decided to reach out to them. And here is the awesome part–not only are they offering a 10% discount exclusive to you Bite Size Vegan viewers, but they are also sponsoring this video because they believe in effective vegan education and activism as much as they believe in providing quality vegan products. So head over to their site and return the love by cashing in on your 10% discount. It’s only good through December 31st, so be sure not to miss out. 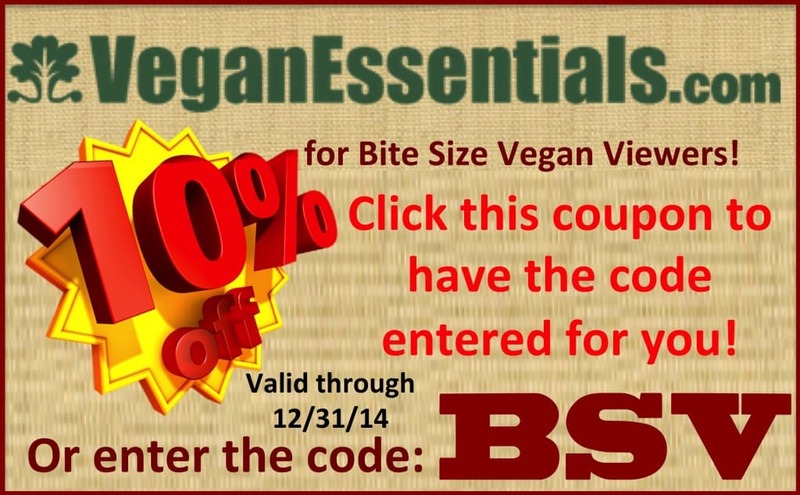 If you use this link or the coupon below, you’ll be taken to VeganEssentials.com with the code already entered. Otherwise, you can simply go to to the site and enter the code BSV by clicking on the “enter coupon” link when you go to check out. I hope you enjoyed my holiday shopping resources. Now that you know what you can buy for your holiday, stay tuned for Friday where I and eight other channels are going to show you what you can eat in a Christmas recipe roundup similar to they Thanksgiving edition. And when you take advantage of the 10% off at Vegan Essentials, be sure to share your find with me on social media with the tag #BiteSizeHumaneHolidayDiscount! Let me know what you plan on gifting in the comments below! DISCOUNT VALID THROUGH DECEMBER 31st- HURRY ON OVER!